Alval Uvani, a traveling Dunmer merchant skilled in Destruction, makes a perfect target for a forest ambush. Find Alval Uvani and decide how you will deal with him. Make your way to the next drop. Bravil, at The Lonely Suitor Lodge on the night of Morndas to Tirdas. Skingrad, at the West Weald Inn on the night of Middas to Turdas. Bruma, at Olav's Tap and Tack on the night of Fredas to Loredas. And finally he should visit his house in Leyawiin on Sundas. Keep in mind that his travels obviously take time, so he might not be at location you'd expect him at the right time. Alval is a strong mage, but he has a rare allergy to honey, which is a key ingredient in mead. If you follow him to a bar and put some mead in front of him, there is a good chance he will take a sip. This will paralyze him, allowing for an easier kill. You can also buy the bar's supply of food and drink, then sell the proprietor some mead for the same effect. For the same effect, break into his house in Leyawiin and replace all the food there with mead. Alternatively, as he travels a lot, it can be very easy simply to kill him in the wilderness. Since Uvani travels through the wilderness often, he may already have been slain by the time you receive this quest. If Alval is already dead when you are directed to kill him, the quest will automatically update and you will be directed to the next dead drop. If you are in the Thieves Guild, you can kill him in the Lonely Suitor Lodge in Bravil without receiving a bounty. Uvani will become hostile toward you when he drinks mead, even if you did not place it near him. 10 I have picked up my next contract from the dead drop in the coffin outside Fort Redman. 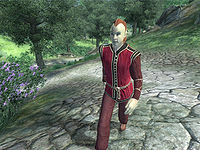 I have been ordered to kill Alval Uvani, a Dark Elf merchant who spends his time traveling around Cyrodiil. I should consult the schedule that has been left for me to determine where and when I should strike. Uvani is a master in the Destruction school of magicka, and has killed before, but he does have a weakness: if Alval Uvani drinks Mead, he will be rendered immobile, due to a rare allergy to honey. 20 I have killed Alval Uvani. I must pick up my reward and next contract at the dead drop located in the Market District of the Imperial City, in a hollowed-out tree stump behind Stonewall Shields. It is possible to use the console to advance through the quest by entering setstage Dark14Honor stage, where stage is the number of the stage you wish to complete. It is not possible to un-complete (i.e. go back) quest stages. See SetStage for more information. Esta página foi modificada pela última vez à(s) 22h29min de 16 de dezembro de 2014.